I made a special Birthday Dinner for my lovely wife last night – and one of her favorites too – Vegan Pepper Steak. I used Onion and Bell Pepper Strips for the veggies, and Portablella Mushrooms for the steak. In fact, the mushrooms replaced the steak strips so well you’d never think this was a meatless meal. And the sauce! Oh my gosh – the sauce! This quick and easy sauce marries the flavors of the peppers and the mushrooms perfectly. I also want to thank one of my readers for the suggestion. 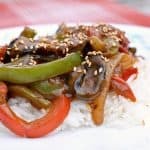 Chinese Pepper Steak is one of those long forgotten meals I used to eat all the time when I was an omni-eater – but honestly never thought about trying to replicate it – until now. I’m SO glad I did! And it was SO easy! 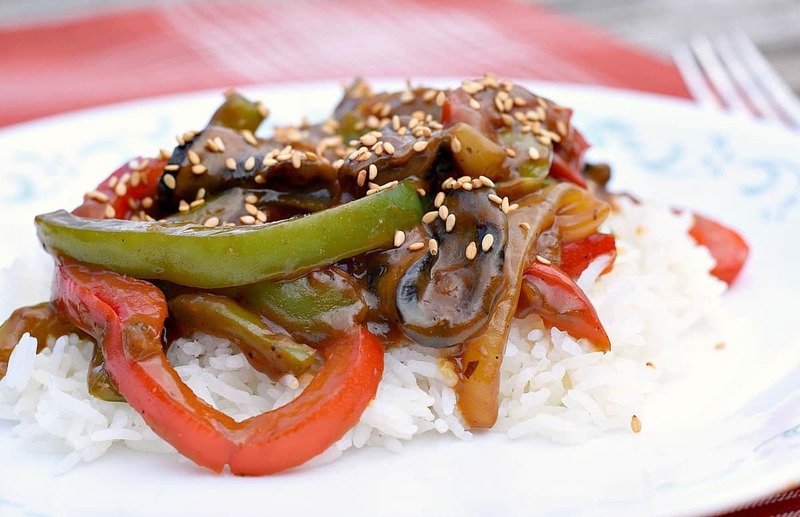 If you like Stir Frys – this Vegan Pepper Steak will instantly be added to your meal rotation – guaranteed! This stir fry is super easy to make and comes together in minutes once the prep work is done. 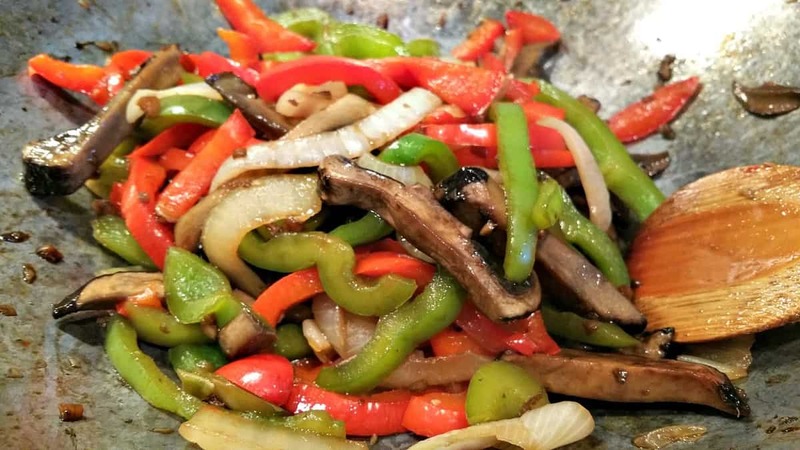 Onions, Bell Peppers, and Portabella Mushrooms make up the bulk of the stir fry – seasoned by a few cloves of garlic and some minced ginger. I marinated the mushrooms in a little Soy Sauce and Mirin – which is a sweet Japanese Cooking Wine you should be able to find in any local grocery store. Look in the Oriental section next to the Rice Wine Vinegars and Soy Sauce. The sauce is a mixture of Soy Sauce, Mirin, Veggie Broth, black pepper, corn starch, and just a scant tablespoon of Tahini for some incredible Sesame flavor. For those of you watching your fat content – a few drops of Sesame Oil would do the trick too. I started by marinating the mushrooms, and then let them sit while I chopped my veggies and made the sauce. Once everything is chopped and prepped and the sauce is done, heat a Wok on high heat until a few drops of water sizzle when you drop them in. Then add your garlic and ginger and a splash of water as necessary to keep from sticking. NOTE: I do not use oil for stir frying. I use an occasional splash of water in my pan to keep things from sticking – that’s it. Oil is completely unnecessary and just adds fat and calories to an otherwise healthy recipe. Try stir frying without oil – and you’ll be amazed how good your food will start to taste without it! Once the garlic and ginger becomes fragrant, add the mushrooms (with the marinade), and stir fry until most of the liquid evaporates. Removing the mushrooms to a separate pan, deglaze the wok with a little bit of water and then add the peppers and onions. Stir fry the veggies until they begin to cook down a bit, and then add the mushrooms back in, followed by the sauce. It will begin to thicken immediately. Stir well to coat and then serve immediately over noodles or rice. Forget about takeout! 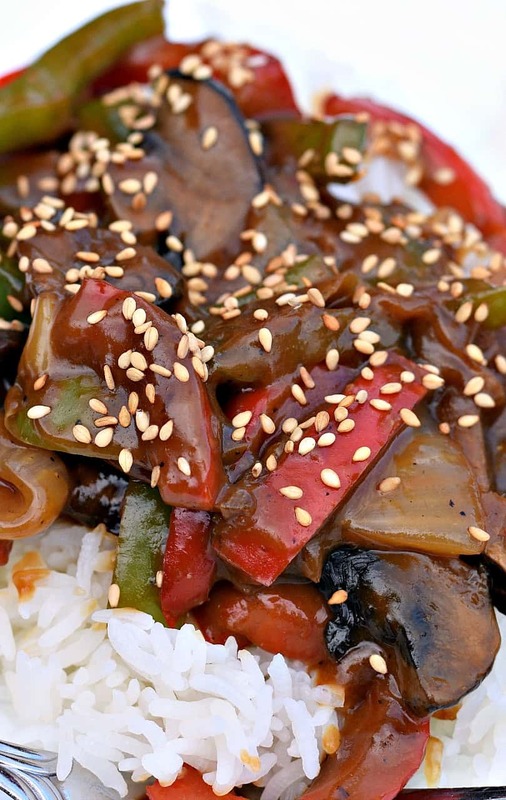 It’s so much easier (and healthier) to make your favorite Chinese takeout dishes at home! 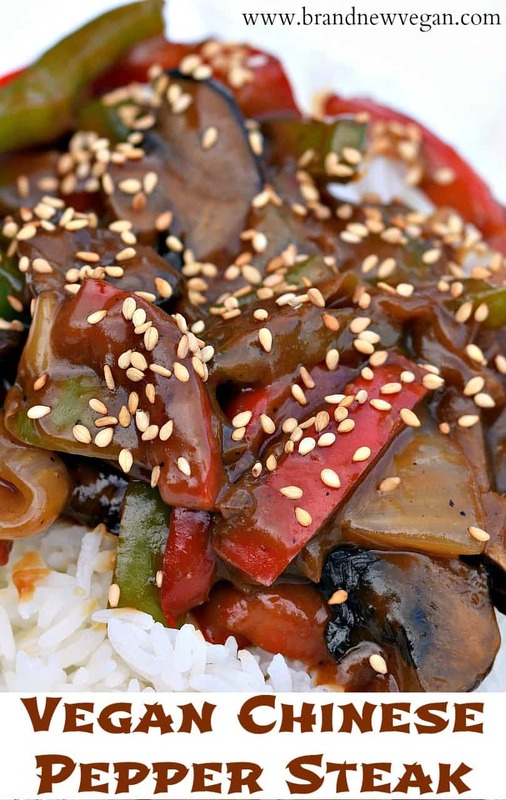 A quick and easy Vegan Pepper Steak - using Portabella Mushrooms as a replacement for the steak. The sauce really ties the peppers and mushrooms together. So much better than takeout! I use Mitsukan that I bought at Fred Meyer/Kroger. It does have corn syrup, but it’s not HFCS. Hope that helps. If you find a healthier version let me know. So I decided to forgo the mirin and used 1/4 cup of dry sherry and added 1/2 tbs maple syrup instead since I always have those on hand. I kept everything else the same. It turned out amazing! Husband raved about it too. I love all your Asian dishes…thank you so much for the fabulous recipes! Chuck, you are amazing. This looks awesome, going to try it out this weekend. Once again, thank you for all that you do! Love it…..I am on this one. Sounds like it would be wonderful on top of a baked potato! I’m trying that. Hi Chuck, would it alter the flavour to much if l left out the tahini. Hi Chuck, Didn’t care for the tahini in the recipe, maybe my tahini’s not so good but it came out tasting strongly of tahini, almost a peanutty taste. Think I will try the sesame oil next time. Maybe your tahini was rancid it can get that way pretty fast if it isn’t stored in the fridge.I used sunflower butter in mine turned out great. Duuuuuude! It’s me again. Just made this tonight. DEEEE-li-cious! You are the man! Can you recommend a sub for the alcohol? I don’t use any, even for cooking, but love your recipes. Ditto! I do not use alcohol even for cooking. I would love to learn a substitute! 🙂 Thank you! 🙂 I was thinking 1/2 white grape juice and 1/2 rice vinegar??? I love this recipe! Thank you! Tonight I made it and found I didn’t have any fresh ginger so I subbed in half a teaspoon of Chinese five spice to the sauce. In the marinade I put in two pinches of Chinese five-spice.